Plus: How much income have you given up for the top 1 percent? Read more: The 10 richest members of Congress, CEO pay vs. American worker pay, and more infographics on the new gilded era. IN 2008, A LIBERAL Democrat was elected president. Landslide votes gave Democrats huge congressional majorities. Eight years of war and scandal and George W. Bush had stigmatized the Republican Party almost beyond redemption. A global financial crisis had discredited the disciples of free-market fundamentalism, and Americans were ready for serious change. Or so it seemed. But two years later, Wall Street is back to earning record profits, and conservatives are triumphant. To understand why this happened, it’s not enough to examine polls and tea parties and the makeup of Barack Obama’s economic team. You have to understand how we fell so short, and what we rightfully should have expected from Obama’s election. And you have to understand two crucial things about American politics. The first is this: Income inequality has grown dramatically since the mid-’70s—far more in the US than in most advanced countries—and the gap is only partly related to college grads outperforming high-school grads. Rather, the bulk of our growing inequality has been a product of skyrocketing incomes among the richest 1 percent and—even more dramatically—among the top 0.1 percent. It has, in other words, been CEOs and Wall Street traders at the very tippy-top who are hoovering up vast sums of money from everyone, even those who by ordinary standards are pretty well off. Second, American politicians don’t care much about voters with moderate incomes. Princeton political scientist Larry Bartels studied the voting behavior of US senators in the early ’90s and discovered that they respond far more to the desires of high-income groups than to anyone else. By itself, that’s not a surprise. He also found that Republicans don’t respond at all to the desires of voters with modest incomes. Maybe that’s not a surprise, either. But this should be: Bartels found that Democratic senators don’t respond to the desires of these voters, either. At all. Click here for more infographics on America’s plutocracy.It doesn’t take a multivariate correlation to conclude that these two things are tightly related: If politicians care almost exclusively about the concerns of the rich, it makes sense that over the past decades they’ve enacted policies that have ended up benefiting the rich. And if you’re not rich yourself, this is a problem. First and foremost, it’s an economic problem because it’s siphoned vast sums of money from the pockets of most Americans into those of the ultrawealthy. At the same time, relentless concentration of wealth and power among the rich is deeply corrosive in a democracy, and this makes it a profoundly political problem as well. How did we get here? In the past, after all, liberal politicians did make it their business to advocate for the working and middle classes, and they worked that advocacy through the Democratic Party. But they largely stopped doing this in the ’70s, leaving the interests of corporations and the wealthy nearly unopposed. The story of how this happened is the key to understanding why the Obama era lasted less than two years. The strength of unions in postwar America benefited nonunion workers, too. Unions made the American economy work for the middle class. It wasn’t always this way. Union leaders like John L. Lewis, George Meany, and Walter Reuther were routine sources for reporters from the ’30s through the ’70s. And why not? They made news. The contracts they signed were templates for entire industries. They had the power to bring commerce to a halt. They raised living standards for millions, they made and broke presidents, and they formed the backbone of one of America’s two great political parties. They did far more than that, though. As historian Kim Phillips-Fein puts it, “The strength of unions in postwar America had a profound impact on all people who worked for a living, even those who did not belong to a union themselves.” (Emphasis mine.) Wages went up, even at nonunion companies. Health benefits expanded, private pensions rose, and vacations became more common. It was unions that made the American economy work for the middle class, and it was their later decline that turned the economy upside-down and made it into a playground for the business and financial classes. Technically, American labor began its ebb in the early ’50s. But as late as 1970, private-sector union density was still more than 25 percent, and the absolute number of union members was at its highest point in history. American unions had plenty of problems, ranging from unremitting hostility in the South to unimaginative leadership almost everywhere else, but it wasn’t until the rise of the New Left in the ’60s that these problems began to metastasize. The problems were political, not economic. Organized labor requires government support to thrive—things like the right to organize workplaces, rules that prevent retaliation against union leaders, and requirements that management negotiate in good faith—and in America, that support traditionally came from the Democratic Party. The relationship was symbiotic: Unions provided money and ground game campaign organization, and in return Democrats supported economic policies like minimum-wage laws and expanded health care that helped not just union members per se—since they’d already won good wages and benefits at the bargaining table—but the interests of the working and middle classes writ large. But despite its roots in organized labor, the New Left wasn’t much interested in all this. As the Port Huron Statement, the founding document of Students for a Democratic Society, famously noted, the students who formed the nucleus of the movement had been “bred in at least modest comfort.” They were animated not by workplace safety or the cost of living, but first by civil rights and antiwar sentiment, and later by feminism, the sexual revolution, and environmentalism. They wore their hair long, they used drugs, and they were loathed by the mandarins of organized labor. But that was just the start. New rules put in place in 1968 led by almost geometric progression to the nomination of George McGovern in 1972, and despite McGovern’s sterling pro-labor credentials, the AFL-CIO refused to endorse him. Not only were labor bosses enraged that the hippies had thwarted the nomination of labor favorite Hubert Humphrey, but amnesty, acid, and abortion were simply too much for them. Besides, Richard Nixon had been sweet-talking them for four years, and though relations had recently become strained, he seemed not entirely unsympathetic to the labor cause. How bad could it be if he won reelection? Plenty bad, it turned out—though not because of anything Nixon himself did. The real harm was the eventual disaffection of the Democratic Party from the labor cause. Two years after the debacle in Miami, Nixon was gone and Democrats won a landslide victory in the 1974 midterm election. But the newly minted members of Congress, among them former McGovern campaign manager Gary Hart, weren’t especially loyal to big labor. They’d seen how labor had treated McGovern, despite his lifetime of support for their issues. The results were catastrophic. Business groups, simultaneously alarmed at the expansion of federal regulations during the ’60s and newly emboldened by the obvious fault lines on the left, started hiring lobbyists and launching political action committees at a torrid pace. At the same time, corporations began to realize that lobbying individually for their own parochial interests (steel, sugar, finance, etc.) wasn’t enough: They needed to band together to push aggressively for a broadly pro-business legislative environment. In 1971, future Supreme Court justice Lewis Powell wrote his now-famous memo urging the business community to fight back: “Strength lies in organization,” he wrote, and would rise and fall “through joint effort, and in the political power available only through united action and national organizations.” Over the next few years, the Chamber of Commerce morphed into an aggressive and highly politicized advocate of business interests, conservative think tanks began to flourish, and more than 100 corporate CEOs banded together to found a pro-market supergroup, the Business Roundtable. They didn’t have to wait long for their first big success. By 1978, a chastened union movement had already given up on big-ticket legislation to make it easier to organize workplaces. But they still had every reason to think they could at least win passage of a modest package to bolster existing labor law and increase penalties for flouting rulings of the National Labor Relations Board. After all, a Democrat was president, and Democrats held 61 seats in the Senate. So they threw their support behind a compromise bill they thought the business community would accept with only a pro forma fight. Instead, the Business Roundtable, the US Chamber of Commerce, and other business groups declared war. Organized labor fought back with all it had—but that was no longer enough: The bill failed in the Senate by two votes. It was, said right-wing Sen. Orrin Hatch (R-Utah), “a starting point for a new era of assertiveness by big business in Washington.” Business historian Kim McQuaid put it more bluntly: 1978, he said, was “Waterloo” for unions. Click here for more infographics on America’s plutocracy.Organized labor, already in trouble thanks to stagflation, globalization, and the decay of manufacturing, now went into a death spiral. That decline led to a decline in the power of the Democratic Party, which in turn led to fewer protections for unions. Rinse and repeat. By the time both sides realized what had happened, it was too late—union density had slumped below the point of no return. Why does this matter? Big unions have plenty of pathologies of their own, after all, so maybe it’s just as well that we’re rid of them. Maybe. But in the real world, political parties need an institutional base. Parties need money. And parties need organizational muscle. The Republican Party gets the former from corporate sponsors and the latter from highly organized church-based groups. The Democratic Party, conversely, relied heavily on organized labor for both in the postwar era. So as unions increasingly withered beginning in the ’70s, the Democratic Party turned to the only other source of money and influence available in large-enough quantities to replace big labor: the business community. The rise of neoliberalism in the ’80s, given concrete form by the Democratic Leadership Council, was fundamentally an effort to make the party more friendly to business. After all, what choice did Democrats have? Without substantial support from labor or business, no modern party can thrive. IT’S IMPORTANT to understand what happened here. Entire forests have been felled explaining why the working class abandoned the Democratic Party, but that’s not the real story. It’s true that Southern whites of all classes have increasingly voted Republican over the past 30 years. But working-class African Americans have been (and remain) among the most reliable Democratic voters, and as Larry Bartels has shown convincingly, outside the South the white working class has not dramatically changed its voting behavior over the past half-century. About 50 percent of these moderate-income whites vote for Democratic presidential candidates, and a bit more than half self-identify as Democrats. These numbers bounce up and down a bit (thus the “Reagan Democrat” phenomenon of the early ’80s), but the overall trend has been virtually flat since 1948. 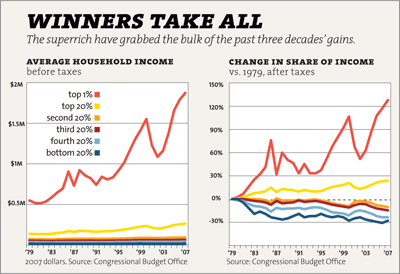 Click here for more infographics on America’s plutocracy.In other words, it’s not that the working class has abandoned Democrats. It’s just the opposite: The Democratic Party has largely abandoned the working class. Here’s why this is a big deal. Progressive change in the United States has always come in short, intense spurts: The Progressive Era lasted barely a decade at the national level, the New Deal saw virtually all of its legislative activity enacted within the space of six years between 1933 and 1938, and the frenzy of federal action associated with the ’60s nearly all unfolded between 1964 and 1970. There have been exceptions, of course: The FDA was created in 1906, the GI Bill was passed in 1944, and the Americans with Disabilities Act was passed in 1990. And the courts have followed a schedule all their own. Still, one striking fact remains: Liberal reform is not a continuous movement powered by mere enthusiasm. Reform eras last only a short time and require extraordinarily intense levels of cultural and political energy to get started. And they require two other things to get started: a Democratic president and a Democratic Congress. In 2008, fully four decades after our last burst of liberal change, we got that again. But instead of five or six tumultuous years, the surge of liberalism that started in 2008 lasted scarcely 18 months and produced only two legislative changes really worthy of note: health care reform and the repeal of Don’t Ask, Don’t Tell. By the summer of 2010 liberals were dispirited, political energy had been co-opted almost entirely by the tea party movement, and in November, Republicans won a crushing victory. Why? The answer, I think, is that there simply wasn’t an institutional base big enough to insist on the kinds of political choices that would have kept the momentum of 2008 alive. In the past, blue-collar workers largely took their cues on economic policy from meetings in union halls, and in turn, labor leaders gave them a voice in Washington. This matters, as Jacob Hacker and Paul Pierson argue in one of last year’s most important books, Winner-Take-All Politics, because politicians don’t respond to the concerns of voters, they respond to the organized muscle of institutions that represent them. With labor in decline, both parties now respond strongly to the interests of the rich—whose institutional representation is deep and energetic—and barely at all to the interests of the working and middle classes. This has produced three decades of commercial and financial deregulation that started during the administration of a Democrat, Jimmy Carter, gained steam throughout the Reagan era, and continued under Bill Clinton. There were a lot of ways America could have responded to the twin challenges of ’70s-era stagflation and the globalization of finance, but the policies we chose almost invariably ignored the stagnating wages of the middle class and instead catered to the desires of the superrich: hefty tax cuts on both high incomes and capital gains. Deregulation of S&Ls (PDF) that led to extensive looting and billions in taxpayer losses. Monetary policy focused excessively on inflation instead of employment levels. Tacit acceptance of asset bubbles as a way of maintaining high economic growth. An unwillingness to regulate financial derivatives that led to enormous Wall Street profits and contributed to the financial crisis of 2008. At nearly every turn, corporations and the financial industry used their institutional muscle to get what they wanted, while the working class sat by and watched, mostly unaware that any of this was even happening. IT’S IMPOSSIBLE to wind back the clock and see what would have happened if things had been different, but we can take a pretty good guess. Organized labor, for all its faults, acted as an effective countervailing power for decades, representing not just its own interests, but the interests of virtually the entire wage-earning class against the investor class. As veteran Washington Post reporter David Broder wrote a few years ago, labor in the postwar era “did not confine itself to bread-and-butter issues for its own members. It was at the forefront of battles for aid to education, civil rights, housing programs and a host of other social causes important to the whole community. And because it was muscular, it was heard and heeded.” If unions had been as strong in the ’80s and ’90s as they were in the ’50s and ’60s, it’s almost inconceivable that they would have sat by and accepted tax cuts and financial deregulation on the scale that we got. They would have demanded economic policies friendlier to middle-class interests, they would have pressed for the appointment of regulators less captured by the financial industry, and they would have had the muscle to get both. This is, of course, pie in the sky. Organized labor has become a shell of its former self, and the working class doesn’t have any institutional muscle in Washington. As a result, the Democratic Party no longer has much real connection to moderate-income voters. And that’s hurt nearly everyone. 1 percent gains $673 billion. That’s a pretty close match. If unions had remained strong and Democrats had continued to vigorously press for more equitable economic policies, middle-class wages over the past three decades likely would have grown at about the same rate as the overall economy—just as they had in the postwar era. But they didn’t, and that meant that every year, the money that would have gone to middle-class wage increases instead went somewhere else. This created a vast and steadily growing pool of money, and the chart below gives you an idea of its size. 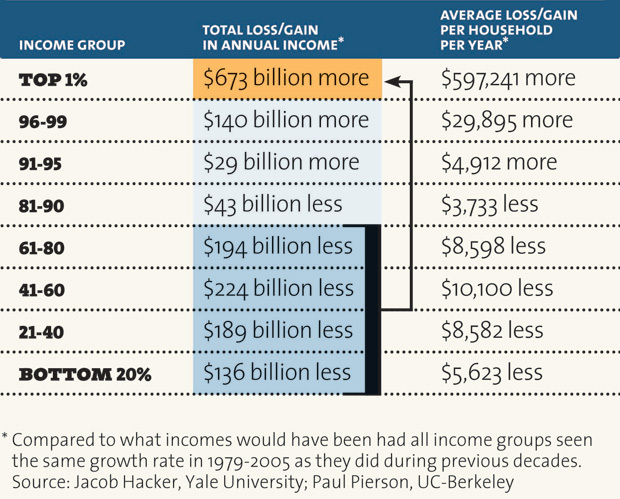 It shows how much money would have flowed to different groups if their incomes had grown at the same rate as the overall economy. The entire bottom 80 percent now loses a collective $743 billion each year, thanks to the cumulative effect of slow wage growth. Conversely, the top 1 percent gains $673 billion. That’s a pretty close match. 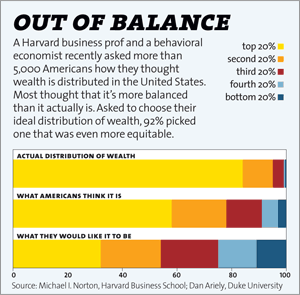 Basically, the money gained by the top 1 percent seems to have come almost entirely from the bottom 80 percent. And what about those in the 80th to 99th percentile? 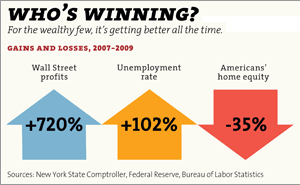 They didn’t score the huge payoffs of the superrich, but they did okay, basically keeping up with economic growth. Yet the skyrocketing costs of things like housing and higher education (PDF) make this less of a success story than it seems. And there’s been a bigger cost as well: It turns out that today’s upper-middle-class families lead a much more precarious existence than raw income figures suggest. Jacob Hacker demonstrated this persuasively in The Great Risk Shift, which examined the ways in which financial risk has increasingly been moved from corporations and the government onto individuals. Income volatility, for example, has risen dramatically over the past 30 years. The odds of experiencing a 50 percent drop in family income have more than doubled since 1970, and this volatility has increased for both high school and college grads. At the same time, traditional pensions have almost completely disappeared, replaced by chronically underfunded 401(k) plans in which workers bear all the risk of stock market gains and losses. Home foreclosures are up (PDF), Americans are drowning in debt, jobs are less secure, and personal bankruptcies have soared (PDF). These developments have been disastrous for workers at all income levels. This didn’t all happen thanks to a sinister 30-year plan hatched in a smoke-filled room, and it can’t be reined in merely by exposing it to the light. It’s a story about power. It’s about the loss of a countervailing power robust enough to stand up to the influence of business interests and the rich on equal terms. With that gone, the response to every new crisis and every new change in the economic landscape has inevitably pointed in the same direction. And after three decades, the cumulative effect of all those individual responses is an economy focused almost exclusively on the demands of business and finance. In theory, that’s supposed to produce rapid economic growth that serves us all, and 30 years of free-market evangelism have convinced nearly everyone—even middle-class voters who keep getting the short end of the economic stick—that the policy preferences of the business community are good for everyone. But in practice, the benefits have gone almost entirely to the very wealthy. The heart and soul of liberalism is economic egalitarianism. Without it, Wall Street will continue to extract ever vaster sums from the American economy. It’s not clear how this will get turned around. Unions, for better or worse, are history. Even union leaders don’t believe they’ll ever regain the power of their glory days. If private-sector union density increased from 7 percent to 10 percent, that would be considered a huge victory. But it wouldn’t be anywhere near enough to restore the power of the working and middle classes. And yet: The heart and soul of liberalism is economic egalitarianism. Without it, Wall Street will continue to extract ever vaster sums from the American economy, the middle class will continue to stagnate, and the left will continue to lack the powerful political and cultural energy necessary for a sustained period of liberal reform. For this to change, America needs a countervailing power as big, crude, and uncompromising as organized labor used to be. Over the past 40 years, the American left has built an enormous institutional infrastructure dedicated to mobilizing money, votes, and public opinion on social issues, and this has paid off with huge strides in civil rights, feminism, gay rights, environmental policy, and more. But the past two years have demonstrated that that isn’t enough. If the left ever wants to regain the vigor that powered earlier eras of liberal reform, it needs to rebuild the infrastructure of economic populism that we’ve ignored for too long. Figuring out how to do that is the central task of the new decade.